This clean and well organized closet design cuts through the clutter of daily life and evokes feelings of simplicity and serenity. Just take a deep breath and relax. 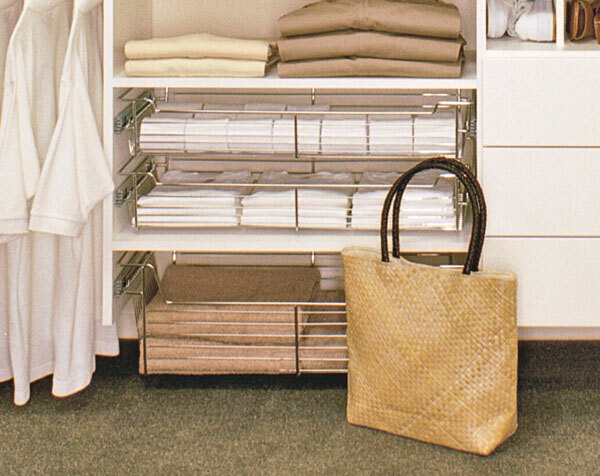 Baskets, shelves and drawers allow you to organize your closet accessories and keep things hidden away until needed. Whether you are organizing your jewelry, socks, shirts or shoes, our custom closet systems are designed to present all of your belongings in a neat and orderly fashion. This type of closet uses suspended installation. It is based on a metal wall rail that is secured to the studs and covered with a paintable, white plastic cover. All of the structural closet components hang o ff of the rail. The weight of the system is carried by the studs and is very strong. The vertical panels accommodate an engineered wall mounting bracket that attaches to the panel and clips over the rail. Horizontal and vertical adjustment screws make for a perfectly square result. There is no need to remove the baseboards or carpeting from underneath this type of closet. 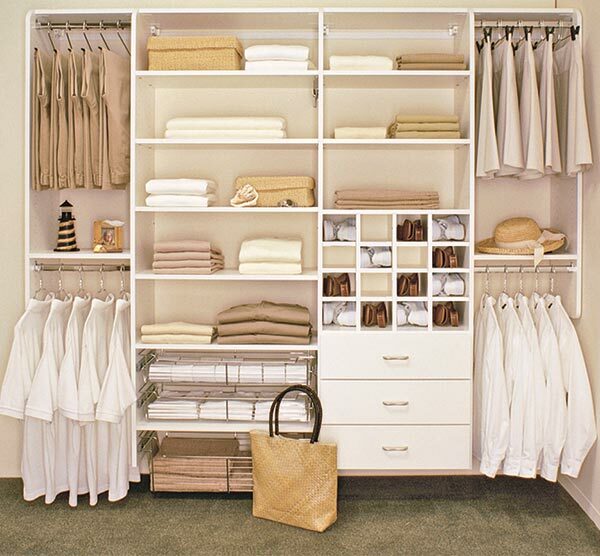 Suspended closets like this one are more budget friendly than floor based systems." Wire baskets keep folded items easily accessible. They are also great for organizing miscellaneous items such as linen and towels. 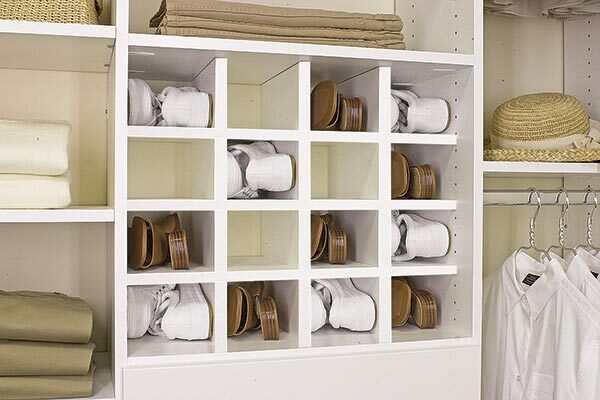 Shoe cubbies are a favorite way to keep shoes organized in a small space. Whether wood or TFL, all shoe cubbies from Closet Works are constructed of sturdy 3/4" material, rather than the standard 1/2" or even 1/4" used by our competitors.